Special Interest Group (SIGs) were formed by Middle East Oracle User Group, to focus specifically on different Oracle users’ community. 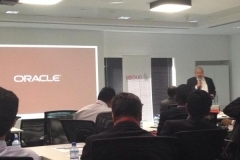 The MEOUG SIG Day 2015 is being organized by 2 SIGs of MEOUG, Oracle eBusiness Suite and Oracle Retail to provide User Community with knowledge, education and real-world experiences from leading organization of Middle East. In a power packed half-day session, you will gain knowledge on 2 specialized areas of Oracle products.